Characters who spend time in BYU’s animation lab—be they lemmings, piñatas, aliens, or the students who create them—have a knack for emerging more well rounded and for earning industry accolades. Harmon clamps his eyelids shut and begins jumping up and down while swinging his arms in wild circles, drawing laughter and cheers. 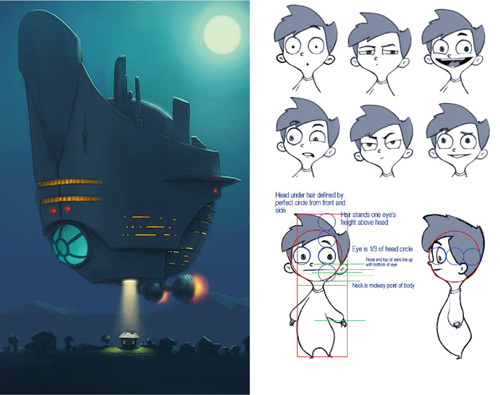 By the end of his calisthenics, Harmon has himself and his audience of animation majors appropriately animated. The mid-March meeting in the basement of BYU’s Crabtree Technology Building is to discuss the evolving plot of the students’ 3-D animated short film, Pajama Gladiator, which, Harmon prefaces, has some problems. At Harmon’s cue a revised storyboard slideshow, which Harmon and others in the group have labored over through the night, begins to flash on the screen. Harmon accompanies the pencil-drawn images with running commentary, which he supports with character voices and sound effects. Together, Harmon and the drawings tell the story of Eli, a blanket-dependent 6-year-old who is beamed from his bed by aliens to fight in a ring of intergalactic gladiators. In the process of battling otherworldly demons, he’s forced to confront one of his own—his need for that blanket. All this takes place within a Calvin and Hobbes–esque reality, in which the line separating fact and imagination is never quite certain. Although the pitch of the revised plot generates laughs and a few guffaws, some of the students aren’t sold on the new version and raise concerns. Faculty mentors chime in from their seats in the back. For the next 30 minutes, the group wrangles over various directions to take the plot. By the end, they’ve made some progress, but they are still working toward a consensus. It’s literally back to the drawing board. It is a frustrating moment, but the group is hardly down. Surrounded by posters and images from award-winning animated shorts—pounded out by previous student teams in the same room through the same painful process—they have good reason for optimism. As they labor over their project, students are keenly aware that their struggles in a diminutive theater over a low-budget, five-minute film will likely lead to things larger—like big-budget, feature-length films for the big screen. Early in student projects, traditional art hones students’ talent and demonstrates that computer animation takes more than technical skill. The animation program is only 5 years old, graduating just its third class this year. Despite its short life, the program has become highly efficient, thanks to what faculty term “the pipeline.” It’s the production conduit that channels creativity from student minds to sketchbooks to storyboards to computer models to fully rendered virtual realities. Adams, a 24-year veteran teacher of design at BYU, says experiencing the pipeline is what most distinguishes BYU students. “Pixar’s people were dumbfounded at how similar our production pipeline is to theirs,” he says. “Well, that’s because we patterned it after theirs. We’re trying to create the studio experience.” A major difference from a studio, he notes, is that BYU students participate in each section of the pipeline, making them more versatile upon graduation. The Pajama Gladiator crew is seven months in. At the beginning of their junior year, with a year’s worth of animation coursework under their belts, they began working on potential stories, with each student required to pitch a plot at semester’s end. The group then selected a story and redecorated the subterranean walls outside the animation computer lab and theater with hundreds of drawings of potential Elis, moms, and alien gladiators. After voting on the character designs, the students then elected a director, technical director, producer, and art director and began working in teams on storyboard, character refinement, and preliminary 3-D modeling. The supercomputers donated by Ira and Mary Lou Fulton allow student creations, like Las Pinatas star Pancho to grow from 2-D sketches to Pixar-quality 3-D animation. “His eyes look too yellow, like he’s a smoker,” a student calls out. “And is that a purple light emanating from his nostrils?” another asks. Someone assures them that those lighting issues will soon be resolved. They’re examining Toro, a googly-eyed animated piñata bull whose 3-D image rotates on the theater screen. The minor lighting quibbles are quickly overcome by a swell of compliments, and applause, for Toro’s exterior texture. Only a few hours have passed since the junior students’ storyboarding discussion, but talk in the theater has slid a year down the pipeline. The senior students are going over “dailies,” or the progress on various elements of their nearly completed animated short, Las Piñatas. Their movie depicts the plight of two piñatas—Pancho and Toro—dodging the blows of a candy-frenzied mob of children at a birthday fiesta. Tilting, rickety buildings in a Mexican barrio create a Seussian scene, making the unlikely plot of the piñatas’ great escape feel right at home. Standing at the side of the screen, director Thomas A. Leavitt (’06) displays more of the team’s recent technical and artistic feats—from the rustling leaves of a tree to the soft sunset glow reflecting off various set angles and textures. He listens carefully to critiques and maps out a plan for revisions. Such images are the fruit of a busy year since the Piñatas team nailed down its storyboard and began producing the film in earnest. Interested computer science students joined the team to help it clear technical hurdles. 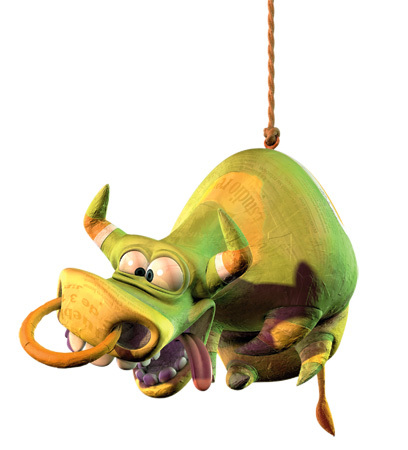 A first step was building character computer models with surface shape as well as internal rigging—the invisible skeleton that allows a character to move. 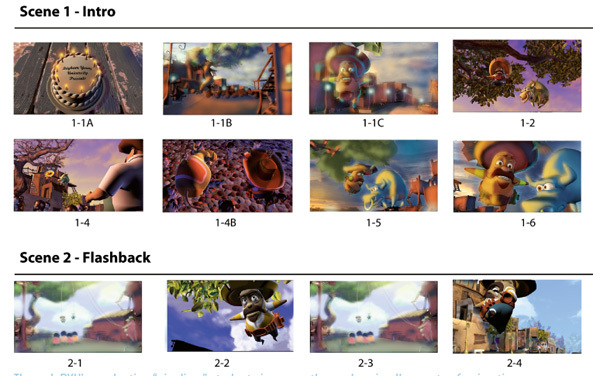 Other groups worked on animatics, transforming the storyboard into a complete, albeit rough, 3-D version of the film with voices and stand-in music. This allowed them to experiment with camera angles and refine story pacing and character development. Despite all they’ve accomplished, what yet remains—character, lighting, and animation refinement; background music; and rendering on the supercomputer—looms large as the meeting wears on. The seniors are slated to graduate in less than two months. The students have been anything but lazy. The annual sprint to finish the seniors’ group project typically goes down to the wire—and often extends beyond, requiring extra work over the summer. Junior students are called upon to help crank out the finished product as graduating seniors begin being hired away. Those who stay on see their average of 20 hours a week in the lab inflate to 60 or more. But Loosli is quick to substitute the word investment for sacrifice, noting the program’s successes in placing graduates amid worldwide competition. 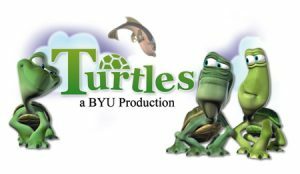 Through BYU’s production “pipeline”, students immerse themselves in all aspects of animation, from character development to storyboarding. Three days later Loosli and Adams sit aboard a jet descending over the sprawling suburbs of Los Angeles. Scattered among the patchwork of communities below are film and effects studios that help make L.A. the entertainment capital of the world. 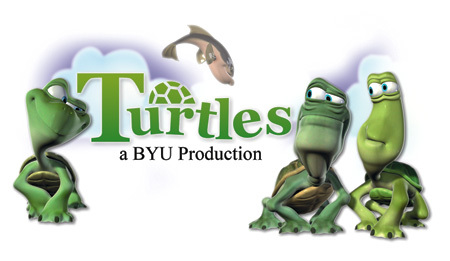 And sprinkled among these companies are many alumni of the BYU animation program. A mid-March trip to L.A. has become an annual pilgrimage for Adams and Loosli. The occasion is the College Television Awards ceremony, where BYU has received two first-place and one third-place “student Emmy” awards from the Academy of Television Arts and Sciences Foundation. Adding the two they’ll receive this year, BYU films have won five of 18 animation student Emmys since 2004, along with other awards at film festivals worldwide. At this year’s black-tie gala, the professors and student producers will be honored for Noggin, the group project finished in 2005, as well as for Turtles, a side project undertaken by Leavitt and other sophomore students two years before. While in Southern California, Loosli and Adams will visit various studios and check in on former students like the Leaches. A third faculty member, instructor of visual arts Ryan J. Woodward (BFA ’93), also looks out for former students in California. While on leave from BYU to finish his MFA degree, Woodward did work on Spiderman 3. He put in a good word for two animation stu-dents who received internships and were later hired to do storyboarding and 3-D animatics on the film. 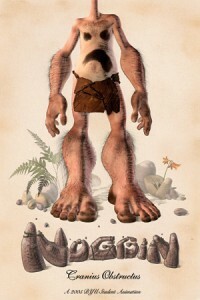 Nearly half of the program’s graduates have put their skills to work in various animation studios or digital-effects companies—from Dreamworks Animation (creators of Shrek and Over the Hedge) to Sony Pictures Imageworks (which provided digital effects for Spiderman and The Lion, the Witch, and the Wardrobe). Nearly all the others have been quickly hired in the rapidly expanding industry of 3-D video games. But as students ride their successes into positions with movie studios and gaming companies, these animation mentors hope their students contribute more than just their brains to the fields they enter. They expect their students to eventually become moral leaders in their fields, bringing high ethics and family-friendly ideals to the entertainment industry. Visit more.byu.edu/animation to see clips from BYU’s award-winning animated films. On a trail blazed by Lemmings, the acclaimed short film that started it all for the BYU animation program, subsequent teams of student animators have found similar moviemaking success. 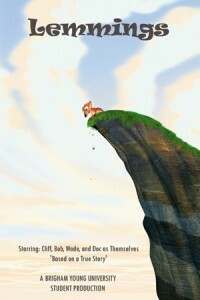 Plot: The animation program’s first 3-D group project, Lemmings tells the story of one plucky arctic rodent’s attempt to talk his clan down from a perilous cliff. Production notes: Students created thousands of lemmings and made realistic fur for the main characters. Notable: The film was mentored by Digital Domain and Dreamworks Animation; seven of the 12 students who worked on the film were hired by animation or effects studios in California. 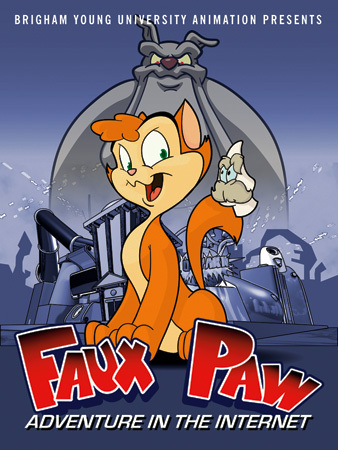 Accolades: First-place student Emmy for nontraditional animation; bronze-medal Student Academy Award; played in more than 20 film festivals, winning several awards. Plot: Desperate for a home, a devious chinchilla goes to great—nearly criminal—lengths to impress Billy, a potential owner. Production notes: PetShop is considered by insiders to be the program’s best-looking film, with lighting, coloring, and textures giving the short a painterly feel. Notable: This film was mentored by artists at Blue Sky (creators of Ice Age and Robots). Accolades: Third-place student Emmy for nontraditional animation; various film-festival awards. 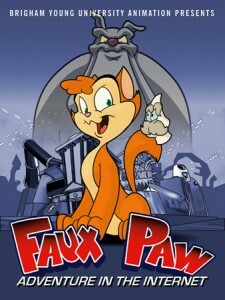 Plot: Faux Paw, the governor’s cat, goes online and finds that the Internet isn’t all catnip and balls of yarn. Production notes: This movie has 3-D elements but was created mainly with traditional animation. Voices for the film include those of former Utah governor and first lady, Mike and Jackie Leavitt. 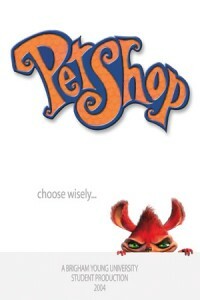 Notable: BYU animators adapted this film and an accompanying book from an original story by Jackie Leavitt. The film and book are now the core of a nationwide campaign (endorsed by 49 of the 50 state first spouses) in which Faux Paw and McGruff the Crime Dog teach grade-school children about Internet predators. Accolades: First-place student Emmy for traditional animation. 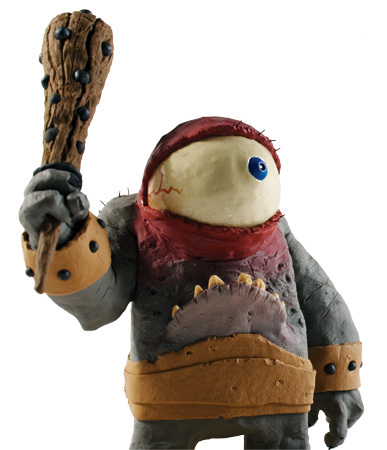 Plot: Having a head on his shoulders isn’t necessarily an advantage as Noggin finds his dome the target of derision from a band of headless creatures called “bellyfaces”. Production notes: Student animators developed a crosshatching shading technique to imitate an archaeologist’s field sketches. Notable: The film was mentored by artists at Pixar (creators of Toy Story and Cars); the score for the film was created by Hollywood composer and BYU grad Alan E. Williams (BM ’90). Accolades: Second-place student Emmy for nontraditional animation; various film-festival awards. Plot: Snappy, a whippersnapper of a turtle, attempts to outshine his wizened rockmates in fishing feats. Production notes: Students lab-ored hard over the water in the turtles’ fishing pond—making it realistic while maintaining an appropriately cartoony feel. Notable: Sophomore animation students banded together to create this animated short as an outgrowth of an Intro to Storyboarding class. Accolades: Third-place student Emmy for nontraditional animation; bronze-medal Student Academy Award. 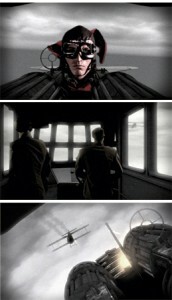 Plot: In a dogfight with an American ace, a German bi-wing pilot discovers an ideal of honor. Production notes: A collaborative project with the film department, this movie splices live actors into a digitally created world. Notable: Animators did extensive research in creating the bi-wing planes as well as the German countryside for the film. Accolades: The film recently played in the Philadelphia Film Festival.